ST. PARIS – The village of St. Paris will begin drawing energy from a ground-mounted 66.24 kW solar electric system at its South High Street well field. Solar panels will be timed to power the water pumps during peak sunlight hours. The new system will provide approximately 76,000 kilowatt hours per year of solar energy at a lower rate than that of DP&L. The village will purchase the solar-powered electricity directly from Solar Power and Light (SP&L) of Miamisburg, which agreed to buy the solar array and equipment from Dovetail Solar and Wind through a power-purchase agreement. As part of the three-party agreement, the village is not responsible for installation, maintenance or decommissioning costs. The village only will pay for electricity generated by the solar modules, which will come at a discounted rate made vailable through state alternative energy tax incentives. 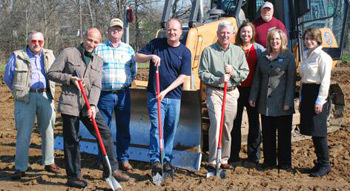 Village officials and representatives of Dovetail, SP&L and the Champaign County Chamber of Commerce were on hand Thursday for the groundbreaking ceremony. Dave Faulkner, economic development consultant for the village, said the village’s Community Improvement Corporation wants to help finance green energy systems for local businesses through power-purchase agreements with green energy developers. With enforcement of state mandates for alternative energy pending, village officials say they want to continue this green energy trend. “Using green energy systems is our ‘new normal’ approach to help control the costs of public services and to help our local business community take control of its energy future,” said Village Administrator Joe Sampson in a statement released by Faulkner on Thursday. “This project enables communities such as the Village of St. Paris to reduce their energy costs and lower their environmental impact,” said Dovetail Vice President Al Frasz in the same statement. Officials maintain the village’s new solar energy system will keep more than 1,500 tons of carbon dioxide out of the atmosphere over the next 25 years.